Sauna was designed by Bas Jacobs, Akiem Helmling,Sami Kortemäki . 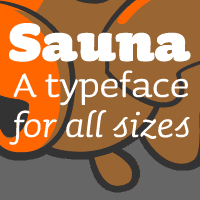 Sauna font is a typeface font, and have a warm feeling. The regular weight is supplied with small caps. Black weight is individual and only made for display use. Besides of these ten fonts, Sauna also has three ligature fonts; one for every weight. They can be used together with the swashy fonts. So in total are 18 fonts on this pack.